NEW ORLEANS — Jury selection began Monday for what is expected to be a lengthy and complex trial arising from lawsuits over an offshore oil platform explosion and fire that killed three workers off Louisiana’s coast in November 2012. The case combines nine lawsuits involving platform owner Black Elk Energy, relatives of the workers killed in the accident, injured workers and companies that were working for Black Elk. About 70 prospective jurors were ushered into the courtroom for questioning. The platform was about 17 miles from Grand Isle, La., in about 50 feet of water. The three-phase trial is expected to last about four weeks. The first phase will deal with Black Elk’s legal relationship with companies working on the platform. Negotiations and settlements on some of the claims and counterclaims were being reached as late as Friday, according to court records. Ellroy Corporal, Jerome Malagapo and Avelino Tajonera died as a result of the accident. The platform was shut down for maintenance and was not producing oil at the time of the explosion on Nov. 16, 2012. 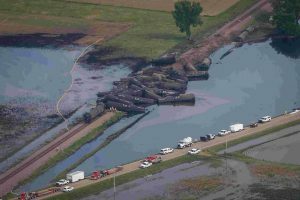 In a 2013 report on the blast, the Bureau of Safety and Environmental Enforcement said storage tanks weren’t properly purged of flammable liquid before a crew began welding nearby. In addition to the lawsuit, federal criminal charges were filed in the case. A January trial is currently scheduled in the criminal case, which includes involuntary manslaughter charges against Black Elk and another company, Grand Isle Shipyards. Both companies have pleaded not guilty.